WASHINGTON (CN) – The Republican plan to replace the Affordable Care Act will knock 24 million people off of health insurance by 2026, the non-partisan Congressional Budget Office announced Monday. The spike in uninsured rates would be felt almost immediately, with 14 million people losing insurance in 2018 alone, according to the CBO report. 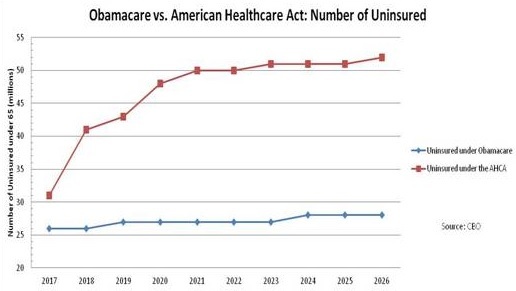 The highly anticipated report found most of the loss in insurance would result from the part of the so-called American Health Care Act that would end enhanced federal funding for Obamacare’s Medicaid expansion in 2020. In addition, average premiums would spike by 15 to 20 percent in 2018 and 2019, but would start to fall relative to current projections after 2020. Young people would benefit from those decreases more than older people, especially considering the provision in the law that allows insurance companies to charge older people five times more than younger people instead of the three times more allowed under the current system, according to the report. Premiums would also rise as because of the law’s repeal of the Obamacare requirement that most people buy health insurance, according to the report. The GOP plan would trim the federal deficit by $337 billion between 2017 and 2026, the CBO found, largely as a result of the Medicaid cuts and the rollback of the health care subsidies included in Obamacare. The Trump Administration responded to the report by arguing that the American Health Care Act would result in more choice in insurance and that the CBO did not consider their whole plan to revamp the health care system, only the legislative portion of that. Tom Price, secretary of Health and Human Services, also questioned some of the CBO’s logic in the report, saying people will not drop off of Medicaid immediately under the new plan. “We think that CBO simply has it wrong here,” Price said. Democrats lambasted the Republican health care bill almost immediately after the CBO released its report on Monday afternoon, saying it should make the party rethink its years-long promise to repeal and replace Obamacare. 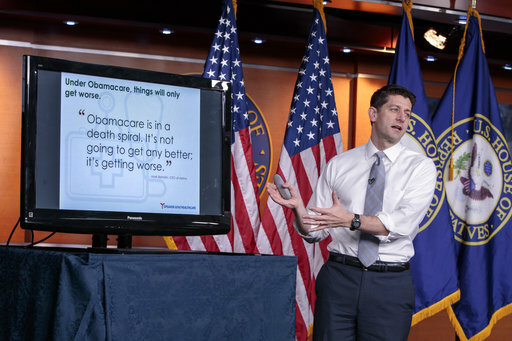 But Speaker of the House Paul Ryan attempted to put a positive twist on the report, saying despite the cuts in insured rates, his party’s plan will give people more choices than they would have under Obamacare. The CBO’s report was the talk of Washington last week as Republicans unveiled the bill and congressional committees began to mark it up. Democrats said Republicans were trying to push the bill through the process before knowing its effects on the insurance market, which lawmakers would only be able to know through the budget office’s formal report.